Successful: "I believe in excellence." 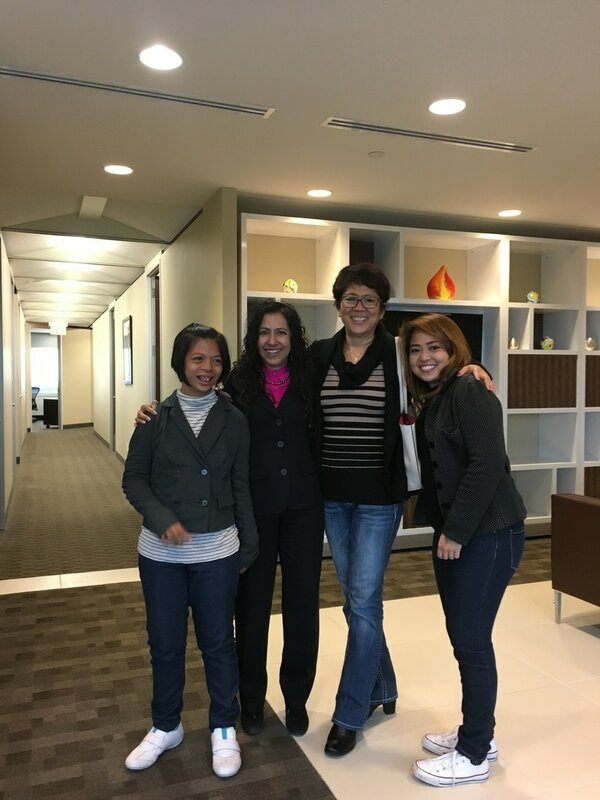 in reuniting a mother with her 2 daughters from the Philippines after 15 years of separation. Read about their case and see their video on the CBC and in the Edmonton Journal by clicking on the links. Shirish Chotalia, an immigration lawyer in Edmonton, said the family isn't alone. Stories of immigrants who are exploited for money abound in her profession, she told CBC News. "It is pervasive and it is fairly common," Chotalia said. "They are coming from desperate situations and they don't know the laws so if anyone reaches out to them they're prepared to take that chance." She recommended that anyone filing immigration papers hire a lawyer or registered consultant, who can be held accountable. "It happens more often than it should," she said about immigration scams. "The system is just rife for abuse." Ms. Chotalia has handled complex injury cases for more than 30 years. She has litigated fatal accident claims, and complex injury cases including brain injury and memory loss. She is not afraid to take insurance companies to court. ​Ms. Chotalia has settled complex injury cases. She can offer you a free consultation to discuss your injury case. Shirish was an intervenor lawyer in the gay rights case of Vriend at the Supreme Court of Canada and the Court of Appeal of Alberta. She has a broad civil litigation background. She also handles Disciplinary Defence cases. She recently defended an accountant against charges of misconduct based on misrepresentation and successfully opposed a heft costs award: L v. ICCA 2014. At times foreign nationals face injustices within the immigration system that simply cry out for redress. When all hope seems lost, courageous immigration lawyers, such as Shirish Chotalia, step in when no one else can. In this episode of the Canadian Immigration Podcast, Shirish shares some amazing stories and even better insight into the world of immigration advocacy….and even better yet, she has inspired me (and hopefully will inspire you as well) to consider taking on difficult immigration cases where the, at times, cruel nature of Canadian immigration law and policy rears its ugly head. "Shirish won my residency case before the immigration and refugee board. She was smart and strategic and now my 2 daughters a I can continue our life in canada. I highly recommend her to anyone with complex challenging cases ." "I am impressed with the work that Shirish has done for Ms. Patel involving the fatal accident of her husband in Alberta. She has delivered results in obtaining significant insurance monies without the expense and delay of estate administration, and in dealing with Section B adjusters. She has exceeded our expectations regarding her work to date. She has been competent, caring and compassionate. We would highly recommend her as a personal injury lawyer to others in need of these services." Suite 3400 Manulife Place, 10180 - 101 Street, Edmonton, Alberta T5J 3S4. *A general practice of law with emphasis in stated areas.